Alchemist has been the best producer for the last 12 years...period. I know a lot of ya'll will be saying "whoa....slow down Kil, what about Just Blaze or Kanye West?" Now don't get it twisted, Just is dope but my knock on him has always been this dude has never produced an entire album for self. Yeah, he can give you a banger here and there but EVERY producer on my top 10 list have produced NUMEROUS album for self. Which is why Just won't EVER come no where near my top 10 list. With Kanye, ever since he admitted that he didn't produce one of my favorite beats I thought was his (Cam's "Down and Out") I gotta question damn near any and everything he's done after "College Dropout" which takes him outta the race. And PLEASE don't even try to put 9th Wonder's name in this discussion cause it just don't belong. Which at the end of the day puts us right back where I started, with Al being the illest producer of the last 12 years. I don't think cats even really understand how much work this dude has put in over the last 12 years. (3 solo compilation albums, over 6 instrumental albums, over 8 collabo albums and over 80 songs produced for other artist...that's an ILL resume for someone's ENTIRE discography let alone just the last 12 years) Not to mention this dude was brought into the Mobb Deep camp when cats already had an ill producer in Havoc. And truth be told Al gave Mobb and P (don't forget Al laced P with "Keep it Thoro") with some of their best moments since the new millennium. So with all of that said it shouldn't come as a shock that when I heard Al had a new album dropping with him not rhyming on it (cause Al's never gonna be in the running in those best producer on the mic convo) and that he was using all samples from russian music to make it, that I was hype as hell to hear it right? The set starts off with some beautiful guitars for the intro "Soundcheck" which blends right into "Apollo's Last Stand" featuring AG Da Crooner who goes in on this jawn something crazy, which blends into "Crushed Kremlin" featuring Meyhem Lauren which blends into "Decisions Over VeL Olroff" that has Action Bronson over an ill trumpet sample that has Bronson telling us "it be that Queens kid with the face like Jim the Anvil/Neidhart, I play the part/smoke the white shark/my mind sharp like a shape up from Dominicans." Never Grow Up" featuring Evidence is straight BONKERS, which blends into "The Turning Point" featuring Roc Marciano which has Roc doing what he does best. "Don Seymour's Theme" featuring MidaZ will leave you scratching your head at first at the sample that Al used but after a couple of seconds you'll get it and this dude MidaZ's flow matches the song perfectly and money kills with lines like "stop me if you've heard this one previous/there's no such thing as smart math that be gen-ius/I usually plan my weekends to cleavage touch/and weekdays, if I feel Jackson/Jeanie Buss." "Kalashnekov Guns" featuring Guilty Simpson and "Oleg's Fight Scene" featuring Fashawn are both dope and "Junkyard Fight Scene" featuring DRDC sounds just like it's title. "The Kosmos Part 1-6" featuring Chuuwee, Boldy James, Big Twins and Willie the Kid all fall in line with the theme of the album but jawn that stands out from the Kosmos series is "Part 7" featuring Mr. Muthaf-ckin eXquire where he tells us the story of being abducted by 3 alien video vixen who he met backstage. "The bed we're laying in, starts to glow/I blink we teleported to a place, where everything is awkward shape/I mean the sun's blue, the snow's hot, the trees glow in the dark/a light stares right through you, and here's your ultimate thought." And when money gets deeper in the story, he freaks the Big convo from "Warning" when the aliens starts to brainwash him, "remember that n-ggaz from the hill up in Brownsville, that you used to chill with, f-ck hoes and trade games with/yeah my n-gga Doe from the plaza/but f-ck that n-gga, he's a traitor and a lil b-tch." But my favorite jawn on the album is the first single "Flight Confirmation" featuring Danny Brown and Schoolboy Q for the simple fact that this beat goes so damn HARD and both cats totally annihilate this jawn! After chillin with "Russian Roulette" for a minute, it kinda reminds me of Dilla's "Donuts"...sorta kinda. And what I mean by that is both really aren't "albums" they're more like soundscapes. It's hard to listen to certain songs off of "Russian Roulette" and get the same feelings you do when you listen to the entire album so it's really more of a concept album then anything else. Some folk may not like the album because it's 30 songs/interludes of nuthin' but loops but that's what makes me like the album. 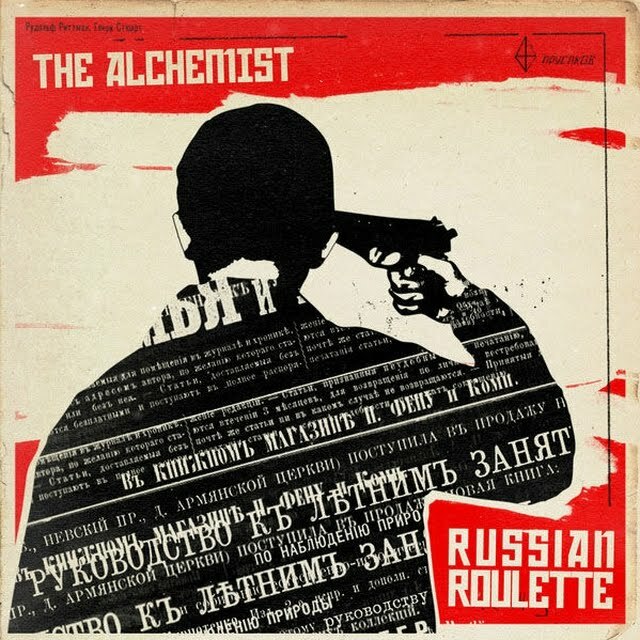 As a producer I know that while diggin you can come across some loops that really don't need anything added to 'em and they can rock by themselves and Al mos def proves that on "Russian Roulette." And any artist/producer should understand that over time you wanna try something different with your music and with "Russian Roulette" Al not only checks in with something that's different but he also checks in with something that's dope.